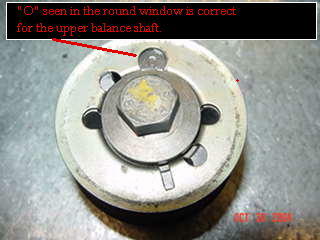 The balance shafts are an area that often gets assembled incorrectly. This page is meant to help you avoid this problem. Porsche uses a counter-rotating balance shaft method to reduce the vibrations made by the crankshaft. 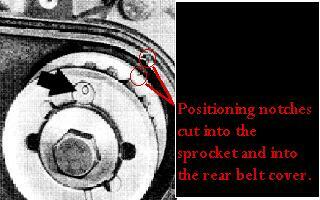 This Mitsubishi patented method is really only needed when the engine speeds exceed 2800 RPM. 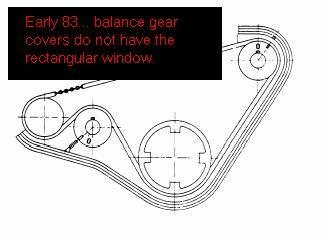 Some report that the balance shafts don't help all that much and impose more risk to the operation of the engine than they justify in smooth running. It is possible to simply not install the balance belt and thereby avoid problems associated with the balance belt. 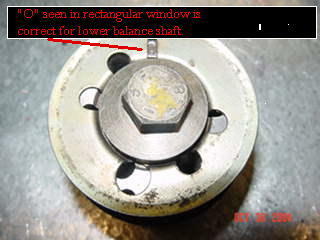 Some feel the balance shafts are critical to to avoid problems with broken accessory brackets and oil pick-up tubes. Porsche realized this potential for trouble and added an attaching part to help the mechanic know the gear is correctly installed. This part is a simply a collar (or cover) that has a small tang and two windows cut into it. The tang will slide into the un-used woodruff keyway and the windows allow you to see the index marks that are stamped into the sprocket. Note: early (1983) 944s did not have the rectangular window or the "tang" - more on this later. One of the windows is rectangular and one is round. 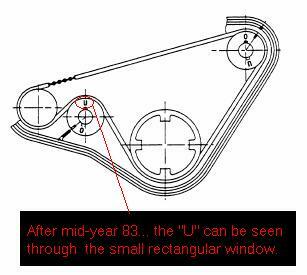 The rectangular window is used for the lower balance shaft and the round window is used for the upper shaft. When installed correctly, you will be able to see the "O" through the corresponding window. 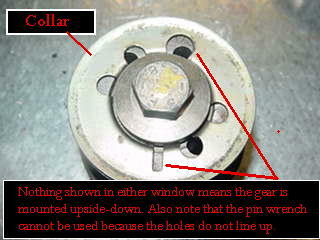 Also note that the holes for the pin wrench are open, Many times when assembled incorrectly, these holes are blocked. The picture above tells the whole story. Porsche has machined a notch in the back surface of the balance gear. 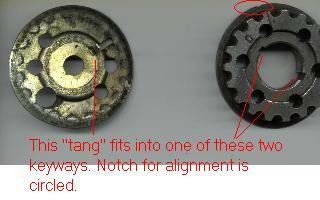 This notch must align with a corresponding notch in the rear plastic belt cover. Be sure to first have the engine (crankshaft and camshaft) rotated to TDC and then simply turn each of the balance shafts until the notches align. 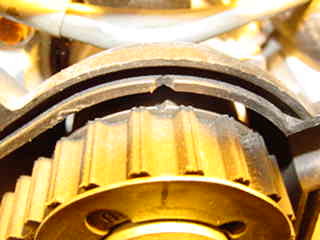 The lower balance gear is to be aligned with a plastic tab (finger) that is molded into the rear plastic belt cover (see above). With the notches in alignment, place the belt on and tension it to the prescribed setting. 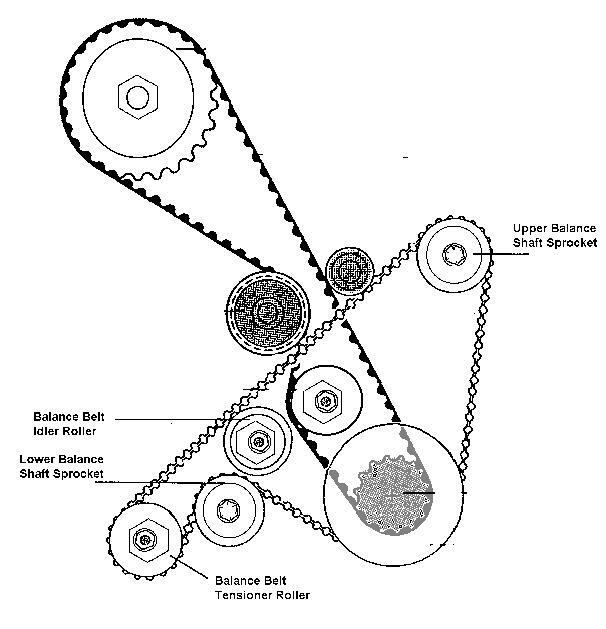 Once slight tension is on the balance shaft belt, recheck the alignment of the the sprockets and adjust as needed. Now, back to those early cars. Look closely at the two photos above - if you have one of the early cars, you'll need to take an extra step to align the lower balance shaft gear. Since the early cars do not have the tang and rectangular window, you will need to remove the cover, align the notch on the rear of the gear to the plastic tab and verify that the "O" is oriented at the 7 o'clock position. One other thing that should be mentioned about the early engines - their rollers were different. In the pics below you can see the difference. 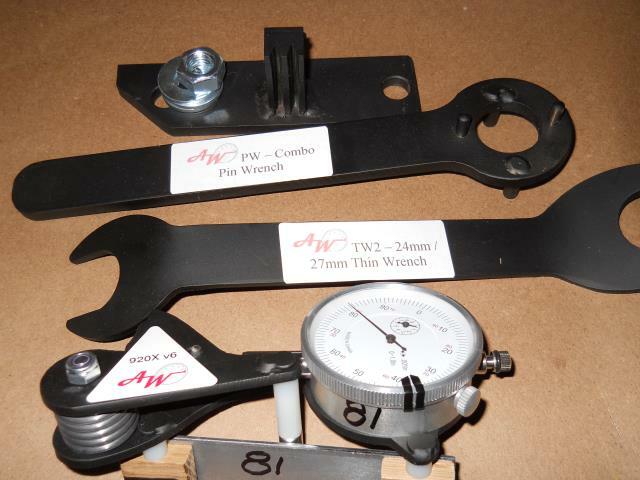 The upper row has the smaller offset nut (24mm). The lower row is from the later cars and has 27 mm offset nuts.